We went out of town this weekend to see friends and participate in the outside world, thus sacrificing our sacred blog time. 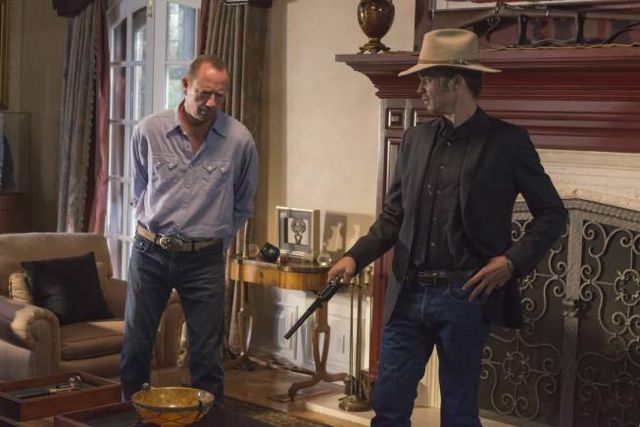 Therefore, just in time for tonight’s new episode, we give you our 15 minute, week old, hideously belated but still in the nick of time rundown of Season 5, episode 2 of Justified: The Kids Aren’t All Right. 1. I’m starting to think that Elmore Leonard had a big hand in casting this show. Amy Smart as Raylan’s newest love interest looks the part, but doesn’t quite fit. She’s too obvious, too articulate, too open to live in this world and hook Raylan as she does. Maybe the producers really liked Amy Smart and Michael Rapaport and Elmore nixed them long ago. Or maybe they thought they just looked like Justified characters and couldn’t tell the difference. Either way, it makes me a bit nervous. 2. I’m also getting a teensy bit nervous about the dialogue this season without Elmore. There were more than a few scenes in this episode that went on just one line too long. I feel like the writers are being a little anxious, and are taking some of the subtlety out of the show. It just seems to go one beat past where it should stop. Or maybe I’m just being a paranoid viewer. It’s possible that I’m watching these too closely, but the rhythm has just felt a tad off to me in these first two episodes. 3. 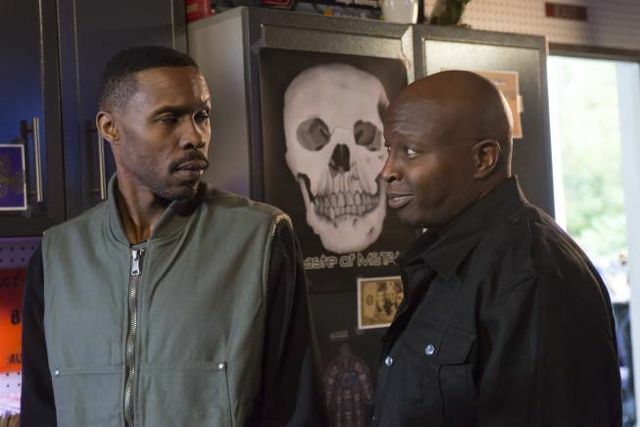 I love having Avon Barksdale in this world, especially as a low level weed enforcer. He and his silent partner are terrifying and hilarious and completely unimpressed by Raylan. I get a very Jody vibe (from last season) with these two, but I hope we get quite a bit more of them before the season’s through. For all the problems I have with the casting this season, these two are vintage Justified. 4. I continue to be pleasantly surprised that Loretta is still around. 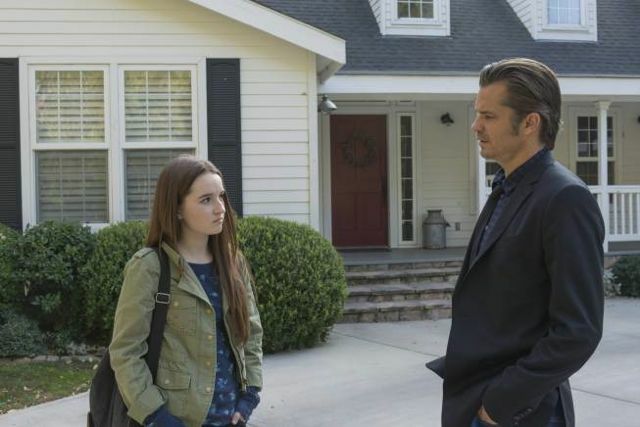 She’s a nice touch in this season where Raylan is learning how to be a father. I hope she continues to play a role in wherever this season is going, though I fear that if she gets wrapped up in Boyd’s increasingly dangerous Harlan drug biz, it will not end happily. 5. Two thoughts on Boyd’s drug biz: 1. Johnny is the one who knocked off Boyd’s shipment, right? If so, where did he get all the manpower? 2. Did anyone else find it disappointing that Wynn failed so completely at talking to the troops in Boyd’s absence? As a Detroit enforcer, shouldn’t he be more commanding? Boyd, as usual, was smooth and cool and enviable, though his need to please ended up costing them when he gave up the time and location of the shipment. Seems like Boyd and Wynn could really benefit from this partnership if they ever get on the same page. 6. Man, things are looking bleak for Ava. 7. I like this turn with Sammy Tonin and Art getting all suspicious, but I’m not sure I buy that there’s enough information there for Art to be getting all suspicious. Maybe I need to go back and watch the end of last season again, but is Sammy Tonin’s phone call enough for Art to go digging? I can’t quite figure out what Art’s version of events looks like. 8. If I had a wish, the Crowe storyline this season would only be about the dirty details of running a whorehouse. It’s a delightfully silly subplot that should exist as a C story, all season long. I mean, what more do you really want from Dewey? 9. It’s always good when Raylan annoys criminals, especially rich ones. Boyd could learn a few things from Raylan in his dealings with the Harlan elite. Time’s up! We’ll be back next week with a regular recap. See you then.